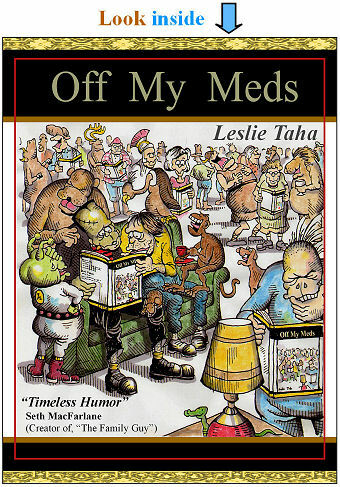 “Off My Meds” is my new book containing nearly 500 single panel cartoons that have for many years appeared in community newspapers, college papers, and magazines throughout the U.S and Canada. The humor is intelligent, bizarre, poignant, sick, insightful, and silly. They have often been compared to Gary Larson’s, “The Far Side” (but it is by no means a cheap “Far Side” imitation). The subject matter is all over the place; politicians, animals, the workplace, healthcare, fables, insects, monsters, and more. You can read , "Off My Meds" online right now for FREE if you promise to write a review of it. It doesn't have to be a long review. Even a one word review like, "funny", "terrific", "fantastic" will do (just a few suggestions). Click here or click the book image above to read it now online. "Off the charts funny Les. My readers and I thank you"
"I think your cartoons are hysterical!" ".... a breath of fresh air for our readers"
"A refreshing sense of humor"
-Creator of "The Family Guy", "American Dad", "Ted"
"Very funny. In the tradition of Gahan Wilson!" "Loved it. Dark, disturbing, and funny"
“I laughed so much, I thought I was reading my own work! Then I realized it was SOMEONE ELSE who had written such funny stuff, and I confined my joy to broad smiling. -Comedy writer for “Cheers”, “Night Court”, "Frazier"